In October, one of the clinics we fund had a 20-year old client who was 25.3 weeks into the pregnancy. In Ohio, the procedures that would allow for an abortion to take place at this point in the pregnancy are prohibited. Like many women in Ohio, and other states where these procedures have been made unlawful, she was referred to a clinic outside of Ohio for the care she needed. She was referred to Dr. Carhart’s clinic in Germantown, Maryland. 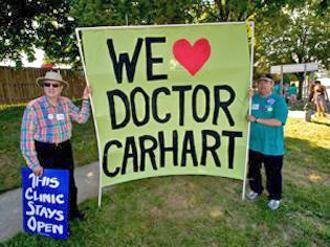 Dr. Carhart’s clinic, one of the few places in the country that can help women needing later-term procedures, is a popular target for anti-choice protesters and a political punching bag for anti-choice activists. It is also one of the few places in the country that many women who find themselves unable to continue a pregnancy can get the care they desperately need. The family was impoverished, and needed assistance for travel, lodging, and food in addition to the procedure. All told, the family needed over $6000 to make the journey. An urgent request for funding went out to the funding community, as the client and her mother needed to get to Maryland as soon as possible. Diverse funding sources stepped up to offer their assistance, including some of the national abortion funds and a local fund near the clinic in Maryland. Other groups and individuals pledged dollar amounts large and small. WHO/O pledged $500 to help this Ohio woman get the care she needed. Staff at the Ohio clinic that originally referred the woman shepherded the woman and her mother onto the bus to Maryland, and met them at the bus stop upon their return. Many, many groups and individuals across the country came together to help a woman afford her reproductive choice. Your donation truly can make the difference for women in situations like this. If you want to help us in our mission of providing real access to reproductive health care for every woman in Ohio, please make a donation here: http://womenhaveoptions.org/donate. With your help, we can ensure that a woman’s right to choose is a right she can access, regardless of finances or anti-choice politics.